In part seven of our 10-part Beatles Interview Series, we'd like to share an interview that took place on June 5, 1968 at Abbey Road Studios during the recording of The Beatles White Album. This is an informal interview conducted by one of the Beatles' favorite radio personalities, Kenny Everett of the pirate radio station, Radio London, according to Jay Spangler of The Beatles Ultimate Experience. Though this interview is primarily with John, the others do eventually make an appearance and in fact, this would be one of the last interviews in which all four Beatles appeared together. 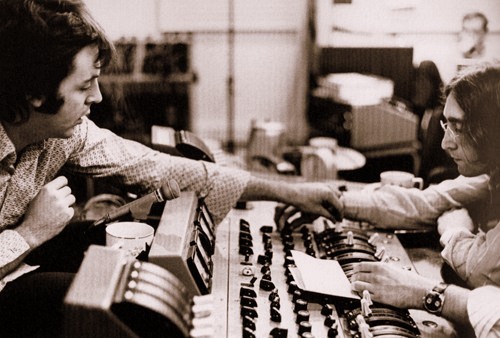 Paul McCartney and John Lennon working on one of the songs on The White Album. JOHN: "So, we better turn the guitaring down a bit, little. So, Kenny, how are you goings?" KENNY: "Oh, it's wonderful. Listen. First a few questions, then I'd like you to sing me a jingle. A goodbye jingle." JOHN: "Okay, a goodbye jingle." KENNY: "What can we expect from you in the next few months? I've heard you're working on it." JOHN: (comical whisper) "Alot of brown paper bags, Kenny." JOHN: "We're working very hard on that at the moment, the boys and me." JOHN: "Oh yeah. There's alot of tunes we've found in the bags, actually." KENNY: "I got told that you don't actually come in here with the idea of doing an album-- it just sort of 'falls out' at the sessions." JOHN: "Mmm. Well, we have a vague idea, you know, Ken." JOHN: (strumming and singing) "'As I was only saying the other day-- we have a vague idea, but very vague-- What's up? Very vague.'" JOHN: "Just a bit of laughter, ladies and gentle-phones." KENNY: "Have you done any actual complete numbers?" JOHN: "No. We're halfway through the second uncomplete number now." KENNY: "You don't actually do them whole complete, finish with them, and then start another one?" JOHN: "See, we got to a stage with one where the next bit is (additional) musicians, so we'll have to write the musicans' bit. You see, you see." KENNY: "Do you ever get to, umm-- you've done your bit and you decide it would be good on its own, and then forget the musicians?" JOHN: (slide guitar and singing) "'Somebody stole my gal/ Somebody stole my pal.'" KENNY: "Can you sing me a goodbye jingle? It doesn't have to rhyme or anything." JOHN: (slide guitar and singing) "'Goodbye jingle/ Goodbye jingle goodbye/ Goodbye.'" KENNY: "Wonderful. (laughs) Are there any particular records at the moment..."
JOHN: "Oh yeah, let me think-- Nilsson. One of Nilsson's." KENNY: "Which one, particularly? As you know we've played quite a few of them." JOHN: "Yes. Oh, let me think, Ken, for the moment. Uhh... 'River Deep Mountain Dew.'" JOHN: (strumming and singing) "'When I was a little baby my mama used to SMASH me in the cradle/ Pickin' those old cotton fields back home/ When mama was a little bitty baby she used to SMASH me in my cradle/ When I was a little bitty baby back home.'" KENNY: "That was impressario John Lennon playing for you. And now, a few words from him." JOHN: "Enzay cuzum dadey stobidacho, Charlie. Masik consip. Wezamarchi chewano wita tomata tawiaty. Wertum moriaty conan dia. Kenny Everetto, M B E."
KENNY: "So that's what India taught you?" KENNY: "Did you come back with anything incredibly fantastic?" KENNY: "Yeah. I met Donavon the other day on a show, and he looked a little better for it." JOHN: "Yes, it was very healthy, you know." KENNY: "I got a photograph of you in the Daily Mirror standing in a sheet. You look very peaceful." JOHN: (jokingly) "Standing in a sheet-- What do you mean?" KENNY: "It looked like a sheet." JONH: "Well they do. Benuses look very, very like sheets, see, so the lower classes in Moracco don't feel too put out-- having only the sheets to wear." KENNY: "Do you have anything to say about anything you've recorded so far?" JOHN: "We've just done two tracks, both unfinished. The second one is Ringo's first song that we're working on this very moment." KENNY: "He composed it himself?" JOHN: "He composed it himself in a fit of lithargy." KENNY: "And what do you think about it?" JOHN: "I think it's the most wonderful thing I've ever heard since Nilsson's River Deep Mountain Dew. (strumming and singing) 'Kenny Everett/ It's the Kenny Everett show.'" KENNY: "Are you composing this straight out of your head?" JOHN: "This is ad nausium-- straight from the mouth that bit me." KENNY: "I don't know how he does it, friends." JOHN: "Neither do I, friends. He's sitting here cross-legged on the amplifier, strumbling away. I hope we're gonna hear this, listeners, because we have alot of fun doing 'em, but never quite hear them, listeners. Never quite hear them when you get home." KENNY: "Well, I will play this completely, all the way through, just for you." KENNY: "What kind of guitar is that? It's very strange looking." KENNY: "How's business with Apple?" JOHN: "Oh, it's... I mean, what can I say? I couldn't ask for any more tapes, or bits of paper." KENNY: (jokingly) "They won't get that, either. But still..."
JOHN: "So, wonderful radio wonders...!" KENNY: "Ask me a few questions." JOHN: "Okay, Kenny. What are you doing?" KENNY: (pause) "Well, at the moment, I'm having a daily show come on soon." JOHN: "Really? So they haven't sacked you? I was getting you a job with the Isle of Man. I put in a word for you with Ronald Manks." KENNY: "If you were stranded away on a desert island, what one grammophone record would you take with you, excluding the Bible and Sgt Peppers for obvious reasons." JOHN: (laughs) "One grammophone record? Uhh... (pause) It hasn't been made yet." KENNY: (laughing) "You don't think there's any records worth taking?" JOHN: "Not all the way to a desert island." KENNY: "When you produce something of such high standards as your last album, don't you think that you've really got to strive to produce something a bit better?" JOHN: "No. It only got high because everybody said how high it was. It's no higher than it was when we made it." KENNY: (laughs) "Yes. There are hidden meanings in that one, ladies and gentlemen." JOHN: (comical voice) "No. What I mean, Kenny, is that it doesn't pose a problem. It was so long ago we've forgotten what it was about anyway. And let me put it this way..."
KENNY: "That's it? (laughs) Hey, listen. You were saying, last time I met you, that you hadn't really had a chance to listen to Sgt Pepper because you'd been so busy making it." JOHN: "I don't think I ever did listen to it, since we made it, properly. I heard bits of it. I mean, I played it just after we made it, and that's it really. (laughs) But I like to hear it on the radio." KENNY: "Alright, shall I play it?" JOHN: "Yes, that'd be nice." KENNY: "Ladies and gentlemen, Sgt Pepper!" KENNY: "Do you think Paul and you could do a duo-harmony jingle?" JOHN: "Well, you'd have to get him." KENNY: "Paul? Can you come and do a goodbye jingle?" PAUL: "Oh! Why, sure Kenny!" JOHN: (strumming and singing) "'Goodbye to Kenny Everett/ He is our very pal.'" PAUL: (singing along) "'Jingle, jingle. Very pal. Jingle.'" JOHN: (sings) "'Goodbye Kenny Everett/ And old Mount Everett, too.'" JOHN AND PAUL: (singing) "'And it's a goodbye rousing cresendo!'" KENNY: "Thank you, John. Thank you, Paul"
PAUL: (giggles like singer Tiny Tim) "Ooo-hoo." JOHN: (excitedly) "Play Tiny Tim! That's what you gotta play! Tiny Tim! He's the greatest ever, man! You see if I aint right, Kenny Everett! He's the greatest fella on earth! Play Tiny Tim, gentle-readers." KENNY: "Tiptoe Through The Tulips." JOHN: "He's real, man. We saw him." PAUL: "I mean, he's good with it. It's like-- it's a funny joke at first. But it's not, really. It's real and it's true." JOHN: "He's great. (sings) 'Tiny Tim for President/ Oh, Tiny Tim for Queen!'" JOHN: (to George) "He'd like to interview with my cohorts for a following few month show." JOHN: "The Kenny Everett Show." GEORGE: (excitedly) "Oh, great! Well, it's nice to be on the air again! Beatle George speaking from the EMI Studios." PAUL: (Tiny Tim giggle) "Ooo-hoo!" KENNY: "It's my last show next week." GEORGE: "Is it? Got the sack, did you?" RINGO: (pounding on drum and singing) "'Goodbye Kenny, it's good to see you back/ Goodbye Kenny, we hear you got the sack!'" GEORGE: "You've got an LP, there." PAUL: (Tiny Tim voice) "Ooo-hoo, it's nice to be here!" KENNY: "Okay Henry, wrap it up." PAUL: (American accent) "Goodbye Kenny, and thank you for all you've done for us in the past." KENNY: "It's been a pleasure." PAUL: (American accent) "You're wrong, Kenny. It has NOT been a pleasure!" JOHN: "Repeat-- Not! N, O, T, O!" KENNY: "Give us a rousing chorus of 'Strawberry Fields Forever' in jazz tempo." JOHN: (singing) "Strawberry Fields Forever... cha ch-cha cha!" PAUL: (singing) "Let me take you down... pah pah, 'cuz I'm going to-- ahh! Strawberry Fields-- ahh! Nothing is real." PAUL: (singing) "And nothing to be going with!" JOHN: "Hoop-hay. I tell ya, pooo-ahhh!" KENNY: "That's the end. Let's go out like that!" JOHN: (yells) "What speed is it?!!" KENNY: "Seven and a half."